If you’ve ever boarded a Tube train after it has reached the end of its line and is preparing to make the return journey, you will have had the experience of wading knee-deep in London’s best cat tray liners – the freesheets. Folded neatly on every seat, splayed across every square inch of floor space and perched haphazardly on every ledge are those peons of journalistic greatness, the Metro, thelondonpaper and London Lite. Together they form a formidable mountain of rubbish, in more ways than one. 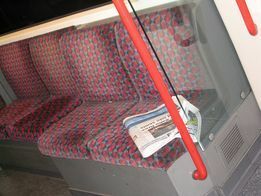 Green campaigners, keen to highlight the vastness of the problem, gathered up 1500 copies of the freesheets discarded by Tube passengers and piled them up in Trafalgar Square for display before carting them off to a recycling centre. Their aim was to demonstrate to the public how their lazy litterbug tendencies impact the environment and contribute to landfill overspill. The freesheets produce 3-4 tonnes of waste on a daily basis. •	Playing drinking games: every time you read the words ‘travesty’, ‘outrage’, ‘nanny state’ or ‘ASBOs’, take a healthy swig. You’ll be pissed in no time. The possibilities are endless, really, so be creative. If you mess about with rubbish, you may even come up with an Olympic logo!